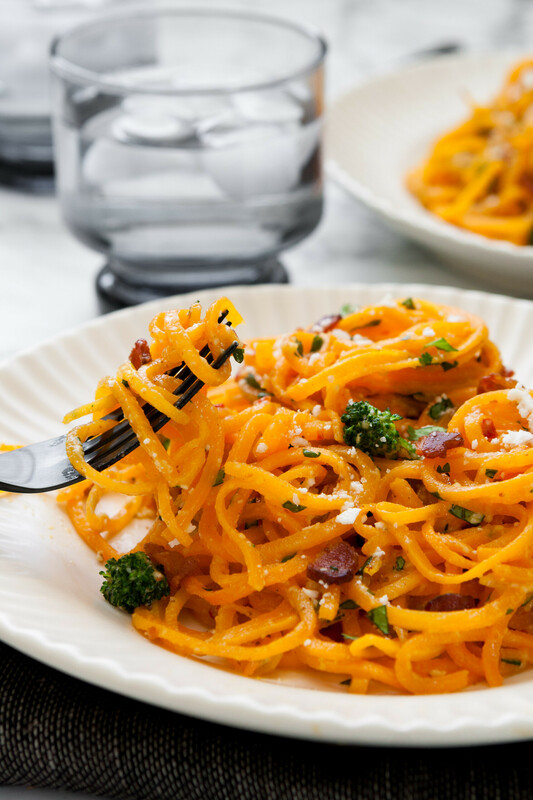 Tender butternut squash noodles are the perfect base for this smoky, Mexican take on the classic pasta dish, carbonara. 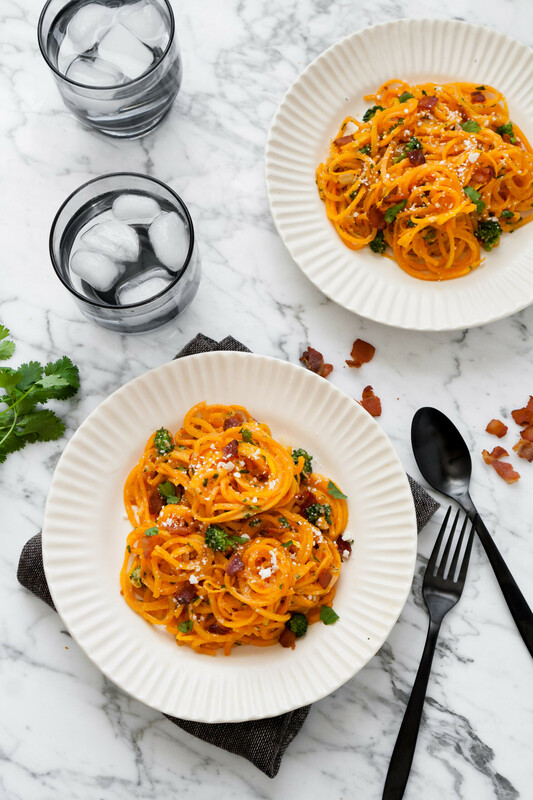 This Butternut Squash Carbonara features a creamy sauce with a kick, broccoli, crispy bacon, and cilantro to create a comforting dish that’s healthy and quick to make. No joke, this healthified carbonara is so freaking delicious. And just because it’s healthier doesn’t mean it lacks oomph. 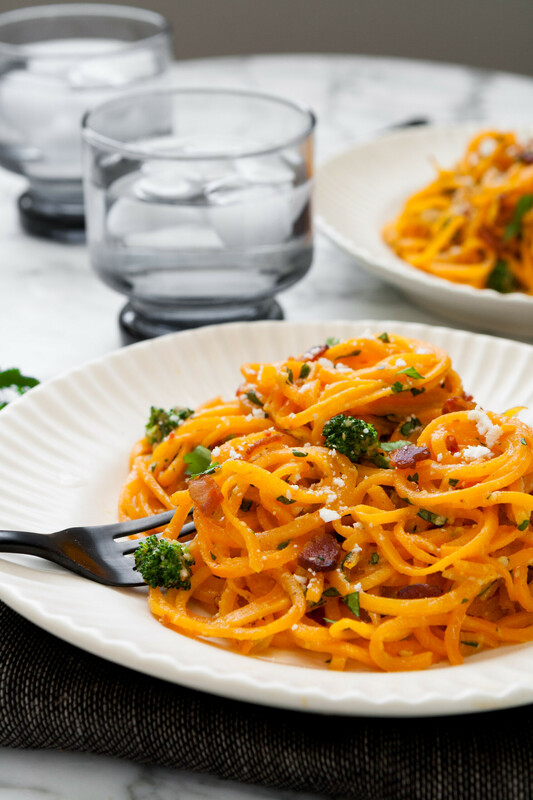 This butternut squash carbonara is equally as delicious as the classic, but in its own way. 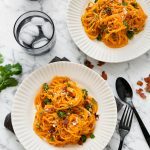 And rightfully so, because this butternut squash carbonara is spicy, smoky, creamy, and packed with good-for-you-ingredients. Whether you’re into healthier options or not, this one is a winner all around. 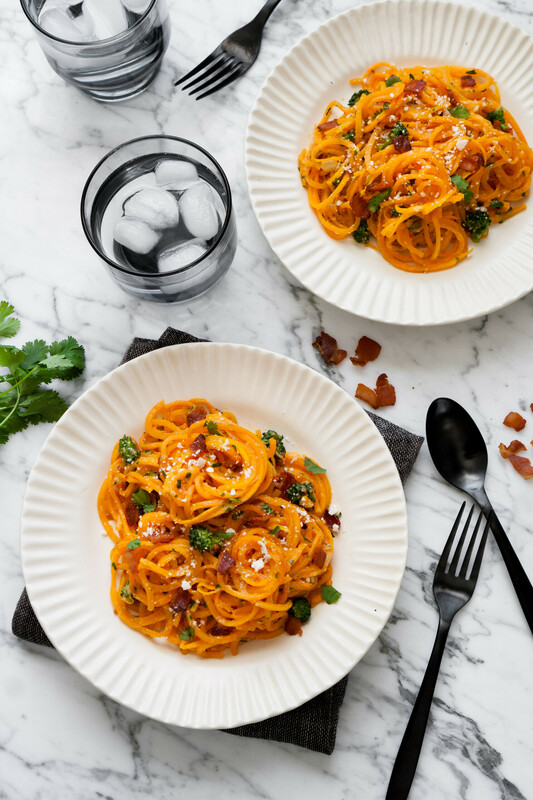 First thing was first when it came to creating the perfect butternut squash carbonara. I had to find the best method for cooking the butternut squash noodles. After doing some research I was pretty set on cooking the squash noodles in the same pan as I was cooking the onions and garlic. I quickly found that wasn’t going to work. Being squash instead of traditional pasta, the noodles lost their shape as they were continuously stirred. But without stirring they would cook unevenly. This eventually led me to the oven, where they not only cook quickly, they cook evenly, and are almost completely hands-off. WIN. WIN. Moral of the story. Bake your butternut squash noodles, don’t sauté them. Baking is much easier and the results are perfection. I chose to use Cotija cheese in this recipe because, ehhem, it’s Mexican! But also because it slightly cools the spice from the chipotle and adds a big, bold punch of flavor. BUT, if you can’t seem to find Cotija (although most supermarkets have it these days, and you can almost bet your Mexican market will), you can use Manchego instead. I will say, for this dish skip the expensive Manchego and opt for a cheaper one since it isn’t front and center here. Save that gold for something it will shine in! If it means anything, G said this was one of his favorite recipes that I’ve made for ZK to date. So either this is a hit, or he’s hated everything else I’ve made. 🙂 I’ll leave that call up to you. Heat oven to 400°F. 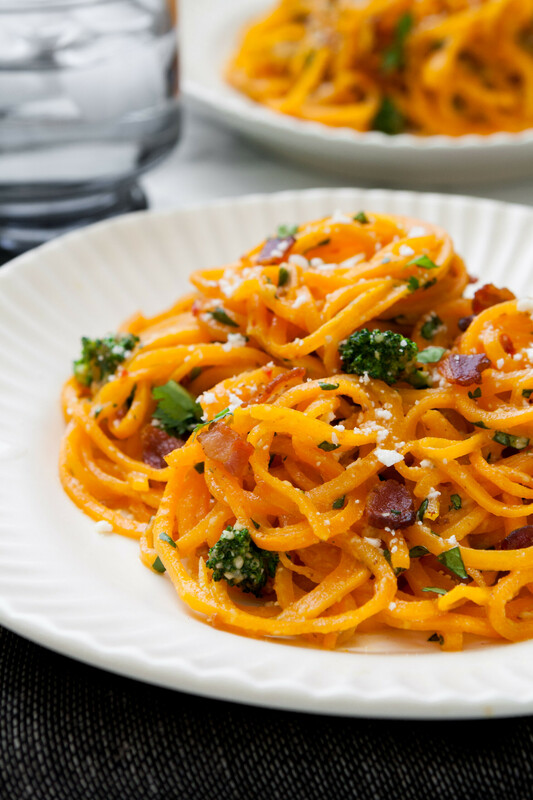 Toss butternut squash noodles with 2 teaspoons olive oil and season with salt. Arrange noodles in a single layer on baking sheet and roast until tender, 8–12 minutes, tossing halfway through. Whisk together eggs, cheese, adobo, and chipotle; set aside. Cook bacon in a sauté pan until crisp. Transfer bacon to a paper towel-lined-plate and pour of drippings (or keep drippings and skip adding 1 tablespoon oil to pan). Add 1 tablespoon oil, onion, and garlic to sauté pan and cook over medium-low heat until softened, about 3 minutes. Add broccoli (or peas) and cook 1 minute. Add butternut squash noodles and toss to coat. Off heat, stir egg mixture into noodle mixture and stir quickly until sauce thickens (but eggs do not scramble). Add water, by tablespoon, until sauce reaches desired consistency; season with salt. Stir in cilantro and top servings with cooked bacon. Did you make this recipe? Let me know what you think in the comments or leave a review below! We made the Butternut Squash Chipotle Carbonara over a cold Minnesota weekend. We don’t have the correct spiralizer so improvised and first sliced up the squash with a mandoline and then cut the slices up into matchstick sized pieces – it cooked up just fine. Fantastic side dish! Great tip for those whithout a large spiralizer, thanks for sharing!